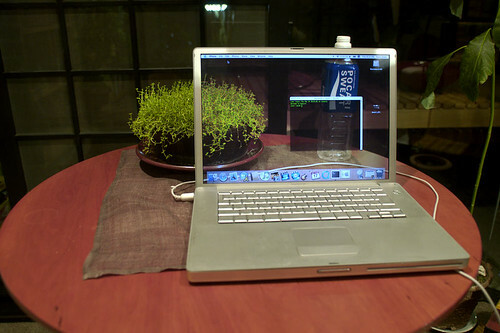 Transparent laptop screens means that your laptop screen gives an impression of being transparent such that you can see all objects behind it. No, your screen does not become transparent. It is a smart visual trick which requires some smart photography, image cropping and perfect laptop placement. Just take a photo of the background you want on the laptop screen. Using any image editing software like Photoshop, Irfanview, or your computers Windows Paint software, crop it to the correct size to match with the background. Make a 800×600 image if your screen resolution is 800×600. Do not stretch any part of the image. Obviously, you have taken the image with a high resolution camera, which is much larger than the screen area, such that you can simply crop it. Select the image as the background image and fit it to the screen. Since you have cropped to size of the laptop screen, you will not have any abberations of edges. Now is the need to perfectly place your laptop in the correct position and angle such that the image seems to be perfectly match with the background and your screen appears to be transparent.